click on icon that says "listen/MP3. 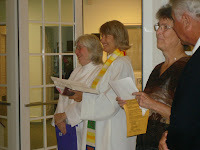 They came from everywhere to call forth Judy Lee as their priest at Lamb of God community in Ft. Myers, Florida. 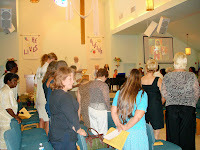 the commissioning ceremony of Dr. Judy Lee, Doctor of Ministry, DSW was held on March 30, 2008 at Lamb of God Church, Fort Myers, Florida. The ceremony began with a welcome by Pastor:Walter Fohs, who said: "We are here to bless and call forth Dr. Judy Lee to serve Christ in our community. She will be ordained as a Roman Catholic Woman Deacon and then Priest and she is a servant called by and confirmed by our ecumenical and interfaith community here in Ft. Myers. Elders in the Church in the Park where Judy and a large group of volunteers serve a weekly meal, read from the Bible and came before the assembly to state why they were calling forth Judy to serve them as their pastor. Members from the Black, Latino, Call to Action, and Lamb of God stated the reasons they were calling Judy forth to continue Christ's work of service to the needy and advocacy for justice for the Beloved Community. Pastor Becky Robbins-Penniman, an Episcopal priest and co-pastor of Lamb of God Church summed up the presentations and called Judy forth. Bridget Mary Meehan, Roman Catholic Womanpriest and Formation Director for the Southern region, presented a reflection of Mary of Magdala as the apostle to the apostles, who was not believed by the male disciples even though she was at the cross and the first witness to the resurrection in all four Gospels. Roman Catholic Womenpriests are ,like Mary of Magdala, responding to Christ's call to go and tell in spite of opposition by the hierarchy. 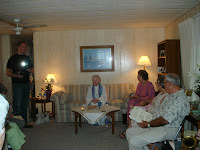 Bridget Mary affirmed the community's call of Judy to servant priesthood. As Judy was ordained, she was carrying the entire community with her, as a witness to her call to go and tell and serve God's people with a loving and compassionate heart. Alleluia, Amen!! Members of the community carried stole, Bible, Cross and bread for ministry. They were bestowed by Rev. Bridget Mary Meehan, Pastor, Walter Fohs, Pastor Becky Robbins-Penniman, and Rev. Joe Irvin. Jack Meehan played a soul-stirring rendition solo on the saxophone of "What A Friend we have in Jesus"
All the community was invited to come up and bless Judy with the waters from the baptismal font. Pastor Walter made the sign of the Cross on Judy's head with the Baptismal water and invited the acompanying community to come forth to do the same. Pastor Judy read her response "Your Servant- A Poem"
The communtiy concluded with the final hymn " I have Decided to Follow Jesus. The Benediction was given by Pastors Walter and Becky . "The Service Begins- Go and Serve". Lamb of God Church volunteers served a dinner and the joyful celebration of Pastor Judy's call to priestly ministry continued the festivities! On March 29, 2008, seven women from the University of Florida, Gainsville visited me and participated in our Mary, Mother of Jesus House Church liturgy. I shared some of the highlights from our year of growth as faith community committed to Gospel equality. This included a look through my scrap book which features pictures of ordinations, house church celebrations, controversy with the Diocese of Venice, newspaper articles etc. Jeff Swicord, from Voice of America-TV flew down from Washington DC to do interviews and to film our Mass. Marcia Copel Chester, a Jewish neighbor joined us and shared the story of how an interfaith spirituality gathering of women called me forth for priestly ordination in 2005. She recounted the story of the joy they expressed when they heard that I was invited to the first North American ordinations .They clearly called me forth to be "their priest". On this occasion, Marcia volunteered to be "our parking lot angel " which consists of coordinating the street parking in our neighborhood, Over 30 people attended this liturgy, including new people from as far south as Englewood and a snowbird visiting from Buffalo. Our dialogue homily focuses on the early church experience of house churches. 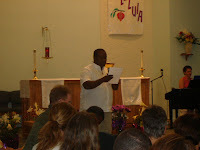 I led our reflection with the story of Mary, mother of John Mark, a leader of one of the house churches in Jerusalem. She was an independent woman wih conisderable resources, including a spacious home which became an imporant center for first-century Christians to meet for worship and prayer. Some commentators believe that Mary presided at Eucharist there and that her home was the headquarters of the Jerusalem church. She was the mother of John Mark a coworker of Paul and a cousin of Barnabas, a missionary apostle in the church of Jerusalem. Mary knew Peter. Since her son worked with Paul, she probably had some connection with Paul. The Acts of the Apostles tells the story of Peter's escape from prison to Mary's home. 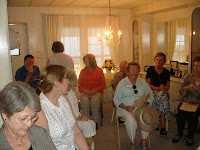 Peter went immediately to Mary's house church where many membes of the Christian community were praying. Peter knocked at the gate. Rhoda, the maid, came to answer and upon recognizing Peter's voice, she was so overwhelmed that, instead of letting Peter in, she rushed back to tell the community, leaving Peter standing at the gate. At first, the community didn't belive her. Meanshile Peter kept knocking and when they opened the gate they were overjoyed to see him. peter then told them the details fo teh miraculous rescue. he instructed them to tell James and the other believers. Then he left. It seems that Mary's house church was the place where believers in jerusalem came regularly to pray and to seek refuge when their lives were threatened. According to the scriptures, there were a number of other women whose names and house churches were also mentioned. Like Mary, their homes also were the first Christian chruches. We have come full circle as reclaim our ancient tradition of "house churches" in grassroots Catholic communities in a renewed priestly ministry in a community of equals! 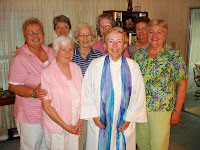 Roman Catholic Womenpriests are working in grassroots communities from British Columbia in Canada to Southwest Florida.